It is a rivalry that has persevered through a massive hurricane and school relocation. 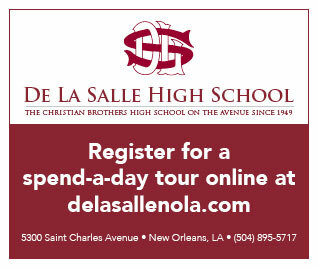 Both Holy Cross and Chalmette have risen from the flooding to beautiful new levels of facilities and both are thriving with excellent schools and students. The deep history and rivalry in all sports continued last night at Chalmette with visiting Holy Cross dominating from start to finish in a convincing 80-44 win over the Owls. It was the third straight win for the Tigers. The Tigers led 16-12 after one quarter behind seven points from Kalil Thomas. Holy Cross took total control in the second quarter, outscoring the Owls 24-6 to lead 40-18 by halftime as Thomas had 11 points at the break. The Tigers continued to pull away, leading 64-30 after three quarters before costing to victory. Tigers head coach Mister Kirkwood likes what he saw. Thomas led Holy Cross (12-4) with 23 points, Aaron Ursin had 14 points, Myles Sanders scored 11 and Sidney Madison chipped in with 10 points. The Tigers return to action Friday night in a tough road game at Bonnabel at 7 p.m. while the Owls (7-9) will try to snap a three-game losing streak Friday at Central Lafourche. This will be the second meeting between Holy Cross and Bonnabel this season. The Bruins won 69-60 in Gonzales on Dec. 8. Back in 2011, Bonnabel hired Kirkwood as its head basketball coach, only to rescind the offer before Kirkwood ever coached a game after a change in school administration resulted in a change in that decision by the school. Belle Chasse at Archbishop Shaw, 7 p.m.
Covington at Independence 6:30 p.m.
East St. John at West St. John, 5 p.m.
Karr at Jesuit, 6:15 p.m.
Livingston Collegiate at Cohen, 7 p.m.
Lusher at McMain, 6:45 p.m.
Pearl River at Bogalusa, 7 p.m.
Pine at Albany, 6 p.m.
Riverside Academy at Lafayette Christian, 7:30 p.m.
South Lafourche at Grace King, 7:15 p.m.
West Jefferson at Lake Charles College Prep, 8 p.m.
Baton Rouge vs. Leedey (OK), 5 p.m. The Church Academy at East Feliciana, 7:30 p.m.
East Ascension at Glen Oaks, 5:40 p.m.
KIPP-B.T. Washington at St. Amant, 7 p.m.
Parkview Baptist at Runnels, 6 p.m.
Southern Lab at Belaire, 6 p.m.
St. Helena at McKinley, 6:30 p.m.
Woodlawn (BR) at Springfield, 6 p.m. Assumption at Central Catholic, 7 p.m.
Plaquemine at Thibodaux, 5 p.m.